This post is part of a series tracking buildings of Dallas, Texas, as they were fifty years ago when President John F. Kennedy was assassinated, and how they stand today. The post series is inspired by research for the second book of the Undead Bar Association Series, Shadowed Demise. Dallas County Criminal Courts Building. Location: corner of Main and Houston streets. On the JFK motorcade route, near the Texas School Book Depository. In this picture from the Warren Commission Report, the building is labeled #4. The Texas School Book Depository (now site of The 6th Floor Museum) is labeled #1. Other connections to the assassination of JFK: This is the building where police intended to bring Lee Harvey Oswald, the man accused of shooting President Kennedy, on the day Oswald was shot. Had Oswald lived, he would have been interred in the jail and tried in one of the building's courtrooms. 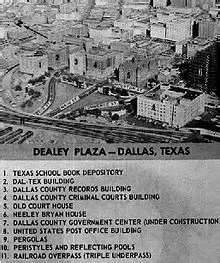 Instead, Jack Ruby, the man who shot Lee Harvey Oswald, was interred, tried, and convicted in the Dallas County Criminal Courts Building. The Dallas Criminal Courts Building was built in 1913. The building housed courtrooms and offices on the lower floors and the county jail on the upper floors. At the time the building was built, the jail was thought to be extremely secure. After all, no one would dare break out of a jail on the upper floors of an eight-story building. Right? Wrong. Many people escaped from the county jail. There was even a break-out during the Jack Ruby trial, on March 6, 1964. One of the escapees took a hostage and walked right past the crowds waiting to hear arguments in Ruby's case. You can see a newsreel preview video of the prison break / hostage situation here. As fake guns made out of soap and colored with shoe polish go, that one's dang good. Here's a second video of the jail break; raw footage. The woman wearing a white dress and dark glasses at the beginning of the video is Little Lynn, one of the dancers from Jack Ruby's Carousel club, a witness in Ruby's case. Little Lynn was being escorted to the courtroom when the jailbreak occurred. Today, the building is used for Probate Court cases and the storage of county records. The jail on the upper stories is not in use, and is not open to the public. The courtroom where Jack Ruby was tried is used for storage, and is also not open to the public. When I clerked in Dallas, one of my co-workers suggested the Ruby courtroom be reopened and put into active use. He thought it could be dedicated to guardianship cases, which fall under Probate law in the Texas legal code. There are a lot of good points to his suggestion, but I don't know how it was received by the county. It certainly stuck with me. In fact, it was part of the inspiration I had for pulling a guardianship case and Jack Ruby into the same novel.